21 Jun 2018 --- Thin Film Electronics ASA (Thinfilm), a supplier of NFC (near field communication) mobile marketing solutions, is supplying el Jimador tequila with digital marketing formats for its bottles and coasters. The tequila brand hopes that tapping into consumer-focused digital marketing techniques will increase the scope of its soccer marketing campaign. 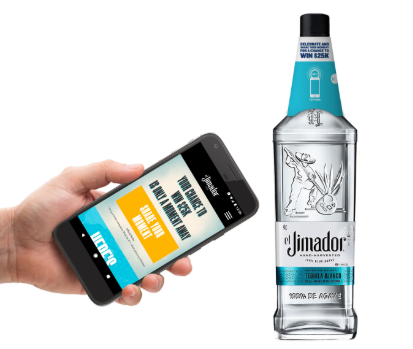 El Jimador – a tequila brand of Brown-Forman, one of the largest American-owned companies in the wine and spirits industry – will use Thinfilm’s complete NFC mobile marketing solution to enhance marketing efforts for its summer soccer campaign. El Jimador sponsored the Mexican National Soccer team’s 2018 US tour. 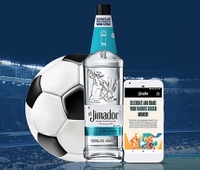 The deal consists of a combination of “smart” bottles and “connected” coasters, making up a key component of el Jimador’s omni-channel “Soccer Moments” campaign. It is believed to be the industry’s largest NFC-related activation ever for a tequila brand, the company state. In collabor Click to Enlargeation with Thinfilm, el Jimador incorporated NFC tags in custom bottle-neckers and branded coasters. When tapped with a smartphone in-store, at home, or on the go, el Jimador customers can instantly submit their favorite soccer story for a chance to win US$25,000, custom jerseys, and other prizes. The NFC tags fully integrate with Thinfilm’s CNECT™ Cloud Platform and enable el Jimador marketers to view real-time tapping activity, analyze campaign performance, and uncover actionable insights. Beginning in June, the connected el Jimador bottles and coasters will be distributed through select retail outlets, bars, and restaurants across the United States. Following its Soccer Moments promotion, el Jimador plans to use Thinfilm’s NFC mobile marketing solution in a “Day of the Dead” campaign this coming October. Thinfilm is enabling the “Internet of Everything” through NFC solutions. They provide consumer-focused NFC mobile marketing as well as industrial and supply chain solutions, including blockchain applications. Thinfilm provides end-to-end support throughout the entire process. This starts with the manufacturing of NFC tags through roll-to-roll printed electronics production process, integration support to get those tags on physical objects, and the CNECT cloud-based software platform which captures data and provides actionable insights into consumer behavior and business logistics. Digital marketing is an increasingly popular tool for companies to connect with their digital-minded customers via packaging.